A new waterfront teaching, research and diving facility at Plymouth University has been formally opened by Prince Albert II of Monaco at a special ceremony today (Thursday 29 October). The Marine Station, located on the city’s waterfront at Coxside, between the National Marine Aquarium and Queen Anne’s Battery, is a first in UK higher education in being the only facility of its type to be within walking distance of the main campus. 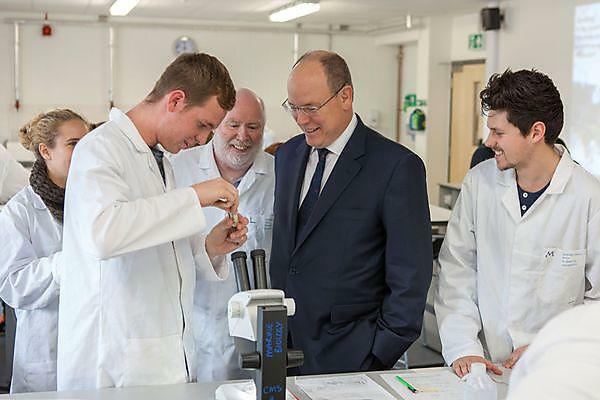 Prince Albert, who holds an Honorary Doctorate of Science from the University, and whose Monaco Foundation supports research into protecting the environment, unveiled a plaque to signal the official opening of the £4.85 million facility. He then took a tour of the building and met staff and students who use it as part of their marine biology and engineering degrees, and for research purposes. “The Marine Station embodies our continued commitment to marine science and engineering, as well as our investment in teaching and learning, research, and the student experience here in Plymouth. And it symbolises our deep connection to the sea, through the heritage of the city, the history of the University and our world-leading work today in marine and maritime. The £4.85 million, two-storey building, has teaching rooms with panoramic views of Plymouth Sound, a 120 square metre ‘wet lab’, where up to 50 students at a time can study samples, which can then be transferred to the aquarium facility served by continuous fresh seawater. It serves as the base for the University’s fleet of vessels, including the research vessel Falcon Spirit and sail-training vessel Take the Helm, and its fully-equipped SCUBA diving facilities not only enable students to learn the skills needed to become scientific divers, but are also a centre for professional diving training for scientists at organisations such as the British Antarctic Survey. Both boats are coded to work up to 60 miles from safe haven, cruise at a speed of approximately 14 knots and can carry 12 passengers and two crew. Seawater is supplied continuously to the Wet Lab and Aquarium, allowing samples to be collected, examined and returned to the sea with minimal disturbance. The Lab can accommodate 50 students or split into two smaller spaces for research project work.